Apartment in Barcelona ideal for a relaxing holiday away from the noise of the city center with all the necessary amenities and easy access to public transport. Its lovely terrace will become the ideal place to relax after a day of sightseeing. Elegant details in its decoration and modern amenities including will welcome you to a great stay in the city. It has two double bedrooms, one with double bed and the other with two single beds. In one open space there are: living room with double sofa bed, dining room, fully equipped open kitchen. Terrace with table and chairs. Note:There are -+20 stairs before reaching the elevator. Find useful information about ADN Apartments area, discover great places to visit during your stay, where to eat and where to go for a drink! Habitat Apartments reply: Thank you for choosing our apartment. For cancellations within 1 days prior to the arrival day we charge the 100% of the total amount. A damage deposit of 300 € will be guaranteed by your credit card. The apartment ADN 11 is located in Sants area. Located in Creu Coberta Street in Sants neighborhood, ADN apartments are in a traditional and very interesting area of Barcelona. Next to the apartment is Plaça España, one of the most important place of Barcelona at the foot of Montjuic hill, and Barcelona Fira. On Montjuic you will find the majestic Palau Nacional, home of the National Art Museum of Catalonia where you can admire Catalan visual arts, and the Foundation Joan Miró for the modern art lovers. Just below the Palau is Barcelona's magic fountain, designed by Carles Buigas, where you can watch a splendid musical light and water show at night. You can also visit Barcelona Olympic Stadium, the Poble Espanyol, an open-air museum where the architecture of each part of the city is represented and the Montjuic Castle from which you will have a stunning view of Barcelona. Metro stop - 185 m.
Metro stop - 282 m.
Plaza de España - 0.34 km. 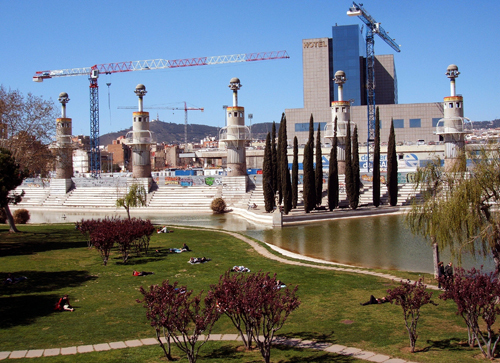 Plaza España is one of the most important and famous squares in Barcelona. It was contructed for the 1929 International Exhibition which was held at the foot of Montjuïc, in the Sants-Montjuïc district. Fira de Barcelona - 0.46 km. Fira de Barcelona is one of the most important trade fair institutions in Europe. Each year, it hosts numerous trade shows and congresses, which bring together leading companies from different economic sectors. Foundation of Joan Miró - 1.60 km. The Foundation is located in the greenery of the wonderful Montjuic and exhibits most of the Miró paintings, sculptures, ceramics, textiles and much more. The largest district of Barcelona, occupies the southern part of town. It is a very authentic with various parcs dotted around. It is one of the areas of Barcelona with the lowest population density, as there is a lot of gardens and park areas and the residential area is mainly in the lower part. Nice apartment, well equipped for a short stay in Barcelona, excellent location, quick check in service. A bit tiny for our group of 6, however we managed just great. The only real problem was the very low water pressure in the shower. It was a real issue especially for the long haired ladies in our group. This needs to be taken care of. I would gladly go back and rent the place again ONLY if that water problem is solved. Beautiful experience and location idela to visit Barcelona. To the left 25 meters stop LINEA 1 HOSTAFRANCS and 15 meters to the right BUS D20 (BARCELONETA, LAS RAMBLAS, AQUARIUM). The apartment is complete with no problem except a non-functioning lamp. Dimitri welcomed us and explained everything to us and provided us with a useful map. Please bring a credit card for a security deposit of 300 euros. Appartement bien situé à 400 mètres environ de la place d' Espane, le métro est à deux pas, commerces à proximité. L' appartement est propre et bien équipé ( sauf le grille pain qui ne fonctionne pas ....). Il convient parfaitement pour 4 personnes est un peu petit pour 5 et 6 personnes.Nous avons eu un bon accueil, la personne a fait l'effort de nous parler en français. Nous avons été satisfait de notre séjour. Excellent location - walk distance to Placa Espana, the Metro station. There is a great restaurant next door, a bakery, a supermarket and big grocery store - fruits, vegetables, meat etc. The apartment is very nice, clean and well accommodated with all you need. It is well appointed apartment. Location is excellent. Many restaurants and bars nearby. It is tiny though and small 6 people can be accommodated in it. Bel appartement,la peinture blanche devrait être un peu rafraîchie mais il est agréable et la literie parfaite. Il est très bien situé proche du métro et de la belle Plaza Espanya ,du centre commercial Arenas et d'un marché ainsi que d'autres commerces (la boulangerie du bas est excellente)Ils ont été arrangeant pour notre heure d'arrivée ce qui est très appréciable,petit hic le ménage n' était pas top mais nous sommes satisfaits et y retournerons sans problème ! perfect location. just top !! I'll be back. rooms very well maintained . has everything which one needs . Dejlig lejlighed med en relativ god beliggenhed. Dejlig tæt på metro. Ærligt at elevatoren ikke køre helt til stueplan når det nu har været en af årsagerne til valget (datter i kørestol). Très bel appartement, très propre, bien situé (à quelques pas d'une station métro), arrêt de bus devant. Spacieux, bien équipé (four, lave vaisselle, frigo, machine à lessiver, planche à repasser) idéal pour 2 couples d'amis ou une famille avec enfants. Le seul point faible durant le séjour c'est lorsque le code d'accès de la porte d'entrée de l'immeuble a été modifié, l'agence m'a uniquement prévenue par mail (pas accès à mes mails dans la rue) alors que l'agence avait bien mon numéro! Just got back from Barcelona, this apartment was exactly what is described on the Internet . The place had all the amenities, beautiful apartment everything's you could thing was provide for. What describe in the description is what you get in the apartment. Me and friends are coming back next year for the carnival and I will be booking the apartment again. I've already show the apartment to friends,you'll be getting some booking.i like the fact the met at the apartment with keys. Very nice apartment. good location. very close to the magic fountains. A little small compared to what we expected from the pictures, but it was enough for a family with three children. For sofa bed, it is great but just need to clean it more (too much dust) //Habitat Apartments Comments: Thanks for your comment, sorry the problem with the sofa, let's talk with our cleaning staff to convey your complaint and take it into account at the next cleaning. Spacious and luminous apartment with terrace up for 6 people. Located in the Sants district, next to Plaza España. For those looking for a place to relax close to Barcelona centre.